The DS1977 is a 32kB EEPROM in a rugged iButton enclosure. Access to the memory can be password protected with different passwords for read-only and full access. Data is transferred serially through the 1-Wire protocol, which requires only a single data lead and a ground return. Every DS1977 is factory lasered with a guaranteed unique 64-bit registration number that allows for absolute traceability. 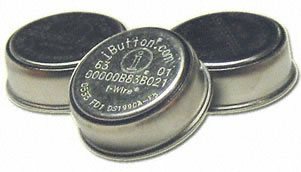 The durable stainless-steel iButton package is highly resistant to environmental hazards such as dirt, moisture, and shock. Accessories permit the DS1977 iButton to be mounted on almost any object, including containers, pallets, and bags.